Don't Say 'Thank You For Your Service' This Monday Memorial Day is specifically to honor those who died in military service. One vet says he'd prefer people say, "I hope you're having a meaningful day." The holiday's history dates to the Civil War. A soldier in the Old Guard places flags at graves in Arlington National Cemetery in preparation for Memorial Day, on May 29. "I hope you're having a meaningful day." That might be one of the better things to say to a veteran this Monday. You should probably avoid the common refrain, "Thank you for your service," according to someone who should know. "On Memorial Day, the veteran you're talking to may be going through a bit of melancholy remembering people who died over the years," says Navy veteran Luke Visconti, who also co-founded the website DiversityInc, which wrote about the subject recently. As most people are aware (or should be), Memorial Day and Veterans Day serve different purposes. Veterans Day is to honor the service of people who have worn the uniforms of the armed forces. 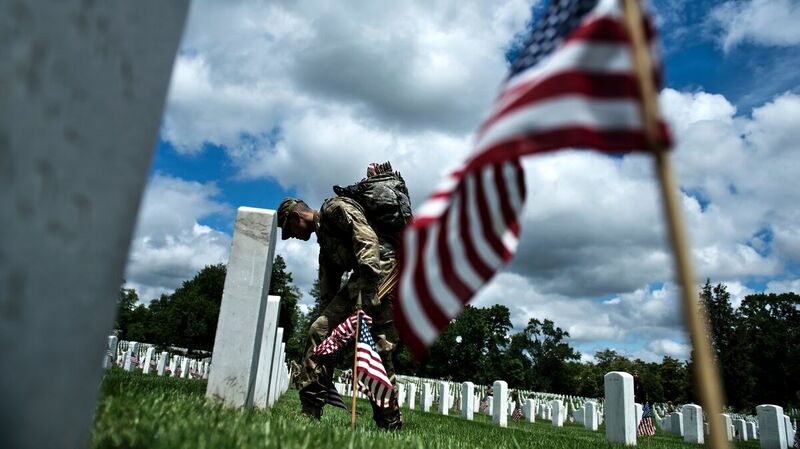 Memorial Day is intended to remember those who died while serving. Visconti encourages those who want to say supportive words to a veteran to recognize "that the person may have friends who died in combat." As far as saying thank you goes, "I don't need to be thanked for my service," he tells NPR's Michel Martin. "I think it's become kind of a platitude, toss-away thing to say." Memorial Day and Veterans Day have separate origins going back to two different wars: the Civil War and World War I. Shortly after the Civil War, Memorial Day began as Decoration Day. "The reason for that is because it was a day on which Americans, South and in the North, would decorate the graves of soldiers who died in the Civil War," history professor Matthew Dennis told NPR in 2005. It was a "vernacular, grassroots kind of expression of mourning." Maj. Gen. John A. Logan, who headed a group for Union veterans, declared in 1868 that Decoration Day would be observed on May 30. According to a Memorial Day history from the Department of Veterans Affairs, after World War I the holiday was broadened to include service members who died in all of the country's wars, not just the Civil War. Multiple cities claim to be the birthplace of the holiday, but President Lyndon Johnson formally gave the honor to Waterloo, N.Y., in 1966. An act of Congress in 1971 switched the observance to the last Monday in May, the VA notes. Veterans Day, on the other hand, was originally called Armistice Day, which commemorated the end of fighting in World War I — you may have heard before that it happened on the 11th hour of the 11th day of the 11th month, in 1918. President Woodrow Wilson celebrated the first Armistice Day in 1919. In 1938, November 11 became a legal holiday by an act of Congress, and in 1954 it was changed from "Armistice" to "Veterans" Day, in order to honor all veterans. So save the thanks for Veterans Day, if you must. "I think sometimes maybe just a pat on the back or an arm around the shoulder is really better than words," Visconti says. "So just be a friend." NPR radio producer Dustin DeSoto and editor Jennifer Liberto contributed to this report.